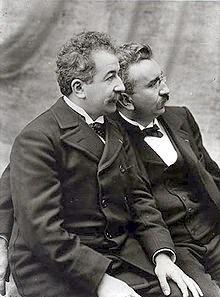 I think I might be disinherited if I failed to write about the Lumière brothers, the inventors of cinematography and -- more importantly in my family -- great pioneers in photography. On the coast walk in Dinard is a spot called La Grotte de la Goule aux Fées; it means something like "the Cave of the Ghoul Witches" ("fée" means fairy, also). It's an unassuming spot but a must-see pilgrimage destination for serious photography and movie enthusiasts who just happen to be taking a coastal walk in Bretagne. In this cave in 1877, brother Louis and August Lumière conducted their first experiments -- some of the first conducted anywhere, by anybody -- on color photography. A plaque has marked the spot since 1984. Specifically, they used the cave as a natural dark-room for their first attempt at color photography development. To access it, there are 30 steps up into the cave, but at low tide. You can see from these (extreme) high tide photos that nobody's going in there when the tides are up. The cave takes its name from sailors and fisherman whose imaginations got the best of them. Legend says that one dark and stormy night, a fisherman whose boat got damaged was thrown from rock to rock. Suddenly, by the light of the moon, he saw a human form, white and foggy, standing at the edge of a cave in the cliffs that had appeared at a lightning strike. Almost immediately, the boat was drawn by a supernatural force into the cavern, where it broke against the rocks. However, the next day, the fisherman was found sleeping at the bottom of a beautiful, new boat, filled with fish and fishing materials. It sounds like a bad movie plot to me, and I wonder if that's the excuse he gave his wife for being out all night. There are other legends as the home of witches who never age or fall ill and who have the power to heal sick children. But beware: If you talk about them, all their kindnesses to your sick children will disappear. Supposedly, the only way to kill them was to put salt in their mouths. If this was effective, then I have to say that living at the edge of a salt-water ocean is not so clever. It is also said that the Marquis de la Rouerie hid in this cave from the national guardsmen pursuing him. I have no idea if, in that story, the Marquis is the good guy or the bad guy. The one story historians mostly agree on, however, is that in the summer of 1877, 17-year old August and 13-year old Louis were on summer holidays in Saint-Enogat, the name for this old section of Dinard. They used the cave as a darkroom to develop their photographic plates, which were attempts at color photos. But while they were in there one time, the tide gradually rose. Scared, the boys made an oath that if they made it out, they would always share credit for their future inventions with their two first names together. The tide went down, and the boys emerged with the beginnings of their famous future company, the Frères Lumière. What I find unbelievable (really, so hard to believe that I've been researching it for nearly an hour to convince myself) is that their last name really is "Lumière", a word that means "light". And it is, in fact, coincidence, as the word far pre-dates their family's business (their father also was an early photographic pioneer). Before we idolize them too much, my dear Papa, you should know that during World War II, they supported Mussolini and the Vichy government. Now that's ghoulish. The name is pretty self-explanatory: "Fromage de Montagne" or "Mountain Cheese". You can guess, therefore, that it's made from milk, generally raw, of cows who graze in the mountains. As such, it's a very general name that tells you, frankly, very little. Basically, it's a cheese that simply doesn't follow the regulations in order to fall into any other categories: it's not a Comté, or a Cantal, or a Beautfort. Just because it lacks a clear identity doesn't mean it lacks flavor. Or that it necessarily lacks flavor. While I'm sure some Fromage de Montagne can be made from pasteurized milks or in an industrial manner, most of the time, they're actually made by smaller producers, often using raw milk -- producers who are too small to conform to the regulations for the more famous, and salable, cheeses. This Fromage de Montagne at least tells us which general mountains this specific sample comes from: Isère. A Fromage de Montagne is not the same as a Meule de Montagne ("Huge Wheel of Mountain Cheese"), or a Tomme (or Tome) de Montagne ("Big Disc of Mountain Cheese"). However, they all share a strong mountain bond: hard cheeses with a slightly sweet grassy flavor from the mountains where the cows graze. The sliver I try is moist and sweet, though not exceptional. It's all right there in the name: The word "lumière" actually means "light", just as the name of this cheese actually means "cheese" However, in the case of the "Lumière" brothers, the association is a coincidence, whereas Fromage de Montagne is clearly named "cheese" because it's a cheese. Meanwhile, while I'm on the topic, I once read somewhere that the word "fromage" comes from the last name of some famous cheese maker and seller to some king in the olden days, but that, of course, is complete and utter hogwash. The word actually comes from the Latin root "formatus", meaning "molded" or "formed", which is also the route of the Italian word "formaggio". Then there's "caseus", the Latin word for cheese ("caseus formatus" meant, therefore, "molded cheese"). The German "käse, Spanish word "queso", and English words "cheese" and "casein" come from this root. My name "Kazz" is pronounced almost exactly like the German word for cheese. But I assure you this is completely coincidence and that I am not named for cheese, nor is cheese named after me.